seawapa.co: How Christianity was invented: the truth ! How Christianity was invented: the truth ! After the invention of speaking and written language, the next step were the creation of control tool. Religion and money were all invented. 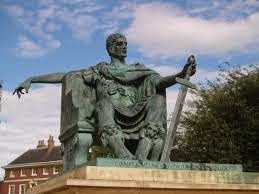 Saint Constantine’s copycat religion was based upon a myth (The Persian savior god Mithra, crucified 600 B.C. ? 400 B.C.? ), which was based on other similar myths, all the way back to Chrishna of India (a mythical god that some claim was “crucified” around 1200 B.C.). There were 16 mythical crucifixions before Christ. The belief in the crucifixion of Gods was prevalent in various oriental or heathen countries long prior to the reported crucifixion of Christ. Of the 16 crucifixions, most were born of a virgin and about half of them on December 25th. At Amazon.com, take a look at the book “Beyond All Religion-Beyond religious SCRIPTURES and practices that support intolerance violence and even war, A PEACEFUL WORLD AWAITS”. Included: How is this for religious intolerance? Rabbi Yaacov Perrin said, “One million Arabs are not worth a Jewish fingernail.” Muhammad married a 6 year old girl. Joseph Smith, the founder of Mormonism had 24 wives, one was 14 years old. Smith was convicted of fraud (of being an “imposter”- a con man), in a court of law... Then he wrote “The Book of Mormon..”. The story of Moses is patterned after the story of Sargon the Great. Moses did not exist. Christianity was invented for political purposes by the Roman Emperor Constantine (“The Great”) in 325 A.D. based on the myth of Mithra (Persian savior god born on December 25th). Look at “Compassion Center” on Facebook. A wonderful alternative to religion. Christianity was INVENTED. Eusebius (Bishop of Caesarea in Palestine “Father of Church History“) attended the Council of Nicaea in 325 A.D. and was a friend of Emperor Constantine, who also attended and made the keynote speech. Constantine instructed Eusebius to organize the compilation of a uniform collection of new writings developed from primary aspects of the religious texts submitted at the council. Eusebius has been described as follows: Jacob Burckhardt (19th century cultural historian) dismissed Eusebius as “the first thoroughly dishonest historian of antiquity”. He has been also described as “a political theologian”. He favored doctoring his history in his own words to “be useful first to ourselves and afterwards to posterity”. Edward Gibbon (18th century historian –“The Decline and Fall of the Roman Empire”) dismissed his testimony on the number of martyrs and impugned his honesty At first, there was controversy about the new religion at the Council of Nicaea. Some claimed it was a fiction and Christ was a fiction, but they did not prevail. http://www.mountainman.com.au/essenes/Council%20of%20Nicaea.htm . Eusebius then arranged for scribes to produce fifty sumptuous copies to be written on parchment in a legible manner, and in a convenient portable form, by professional scribes thoroughly accomplished in their art (ibid.). These orders, said Eusebius, were followed by the immediate execution of the work itself we sent him [Constantine] magnificently and elaborately bound volumes of three-fold and four-fold forms (Life of Constantine, vol. iv, p.36). They were the New Testimonies, and this is the first mention (c. 331) of the New Testament in the historical record. With his instructions fulfilled, Constantine then decreed that the New Testimonies would thereafter be called the word of the Roman Saviour God (Life of Constantine, vol. iii, p. 29) and official to all presbyters sermonising in the Roman Empire. He then ordered earlier presbyterial manuscripts and the records of the council burnt and declared that any man found concealing writings should be stricken off from his shoulders (beheaded). NONE OF THESE 50 NEW TESTAMENTS EXIST TODAY OR ARE ADMITTED TO EXISTING! THIS NEW TESTAMENT WAS THE OFFICIAL BOOK OF THE NEW UNIFIED RELIGION OF CONSTANTINE NOT THE BIBLE! IT INCLUDED BURNING THE GREAT LIBRARY OF ALEXANDRIA IN EGYPT 391 A.D. The Serapeum housed the Great Library of Alexandria. http://en.wikipedia.org/wiki/Library_of_alexandria Why there are no records of Jesus Christ? BUT WAIT, WHAT DOES THE CATHOLIC CHURCH SAY ABOUT THIS? What (your local) Church doesn’t know and/or wouldn’t want you to know, if they knew. It has often been emphasized that Christianity is unlike any other religion, for it stands or falls by certain events which are alleged to have occurred during a short period of time some 20 centuries ago. Those stories are presented in the New Testament, and as new evidence is revealed it will become clear that they do not represent historical realities. The Church makes extraordinary admissions about its New Testament. For example, when discussing the origin of those writings, “the most distinguished body of academic opinion ever assembled” (Catholic Encyclopedias, Preface) admits that the Gospels “do not go back to the first century of the Christian era” (Catholic Encyclopedia, Farley ed., vol. vi, p. 137, pp. 655-6). This statement conflicts with priesthood assertions that the earliest Gospels were progressively written during the decades following the death of the Gospel (sic) Jesus Christ. In a remarkable aside, the Church further admits that, “the earliest of the extant manuscripts [of the New Testament], it is true, do not date back beyond the middle of the fourth century AD”– (Catholic Encyclopedia, op. cit., pp. 656-7). That is some 350 years after the time the Church claims that a Jesus Christ walked the sands of Palestine, and here the true story of Christian origins slips into one of the biggest black holes in history. There is, however, a reason why there were no New Testaments until the fourth century: they were not written until then, and here we find evidence of the greatest misrepresentation of all time. It was British-born Flavius Constantinus (Constantine, originally Custennyn or Custennin) (272-337) who authorized the compilation of the writings now called the New Testament. Yes, but what about references to the four Gospels supposedly before the 3rd Century A.D.? For example: What about Tacitus, Roman Historian, who wrote about the persecutions of the early “Christians”? Regarding Tacitus, (Senator and Historian of the Roman Empire) these writings supporting the persecution were mysteriously found in the 15th century in the forests of Germany, following a reward offered by Leo X for old writings, and following a history of forgeries in Catholicism: In any case, there has been serious questions about the integrity of the famous passage about Christians. From: http://www.earlychristianwritings.com/tacitus.html Gordon Stein denied the authenticity of this passage, arguing: (1) no corroborating evidence that Nero persecuted the Christians (2) there was not a multitude of Christians in Rome at that date (3) Christian was not a common term in the first century (4) Nero was indifferent to various religions in his city (5) Nero did not start the fire in Rome (6) Tacitus does not use the name Jesus (7) Tacitus assumes his readers know Pontius Pilate Yes, but what about Josephus? His reference to Jesus in Testimonium Flavianum has been claimed as a later addition, (Forgery-Author) not questioning the authenticity of the main work. Yes, but what about Pliny the Younger’s letter to Emperor Trajan 112 A.D.(Pliny was not a contemporary of Jesus, and he never mentions “Jesus”?) Pliny the Younger (c. 61 – c. 112), the provincial governor of Pontus and Bithynia, wrote to Emperor Trajan c. 112 concerning how to deal with Christians, who refused to worship the emperor, and instead worshiped “Christus”. Nevertheless, I was concerned about the possibility of far older Gospels when I was stating that Christianity was invented around 325 A.D., but the research thread leads back to Eusebius, the FORGER, (“Papias, quoted by Eusebius…”). Eusebius was the dishonest Church Father historian of antiquity who made up a lot of Church history. “we shall introduce into this history in general only those events which may be useful first to ourselves and afterwards to posterity”. The research thread (about older Gospels) also leads to the “spurious” writings of Irenaeus: http://www.sodahead.com/united-states/gospels-late-forgeries/blog-249881/. THE RELIGIOUS QUICKSAND OF EARLY CHRISTIAN WRITINGS. A SCHOLAR AND YOU WILL BE QUICKLY SWALLOWED UP IN QUICKSAND RESEARCHING SO-CALLED “PRE-NICENE” WRITINGS. What about pre-nicene so-called “Early Christian” (Gnostic?) writings?They disagreed with each other, were riddled with conflict and forgeries, of questionable and confusing timing and origin , had conflicting opinions about supposed truths, and were not coherent enough for an organized religion. So the myth of Mithra, the Persian Savior God, was chosen by Emperor Constantine and Bishop Eusebius as the model to create the new religion , Christianity. What if there are references to Christ and/or Jesus in pre-nicene writings? That doesn’t mean Jesus or Christ existed. What if there are references to “fairies” in pre-nicene literature? That wouldn’t mean fairies existed, prior to the Council of Nicaea in 325 AD or later, even if the Council claimed the existence of fairies and made it doctrine, with severe penalties for those who denied their existence. In any case, the Catholic Encyclopedia itself supports the thesis that the Gospels of Christianity were written no earlier than the 4th Century: “the earliest of the extant manuscripts [of the New Testament], it is true, do not date back beyond the middle of the fourth century AD”– (Catholic Encyclopedia, op. cit., pp. 656-7).